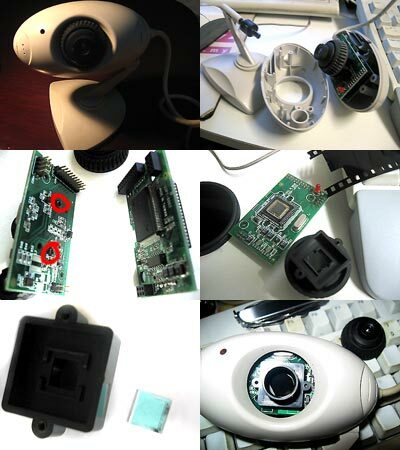 This infrared webcam project is thanks to Syefri, whose old webcam was used! The webcam is screwed. I mean, unscrewed. I then had to pull apart the webcam, and unscrew the screws to remove the lens mount covering the CCD sensor. Left to right: 52mm Hoya R72 infrared pass filter, circuitboard with the CCD exposed in the middle, the lens mount that covers the CCD, and the black part of a 35mm film negative. I then used a screwdriver to pop the infrared cut filter (the blue glass piece) out of its slot on the lens mount. I then cut the negative so it could sit in front of the lens mount, where the lens was then screwed on. Your webcam may vary; the infrared cut filter may be painted on! 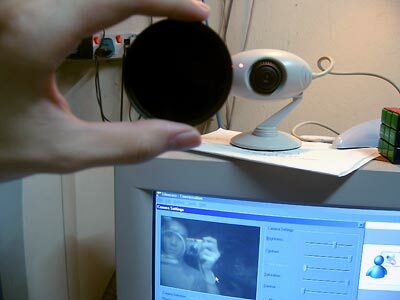 This webcam had a manual focus lens; from outside, in order, it would be the manual focus lens, followed by its lens mount (with the infrared cut filter), followed by the circuitboard (with the CCD on it) and another circuitboard, and finally, the back of the webcam casing. The infrared pass filter is held up to the webcam; as you can see on screen, it is transparent! Flourescent lamps do not emit much hot infrared light, so I had to use a tungsten bulb so people could see me on webcam. CCDs can capture normal light and infrared light. Human eyes only see normal light. However, infrared light stains the picture with purple highlights, so webcams and digital cameras have an infrared cut filter installed. I had to remove that, and put an infrared pass filter (namely the film negative) to block out normal light and let only infrared light through. On my Canon Powershot A520 however, the warranty has not finished and I do not dare operate on such a digital camera that is not cheap, so I use a Hoya R72 filter (infrared pass filter). Internally, its infrared cut filter still lets a little infrared light in, so I can get sunny exposures in less than one second. Anyway, does anyone have a cheap old working 1 megapixel digicam? I’d like to buy it from you to make an infrared camera! 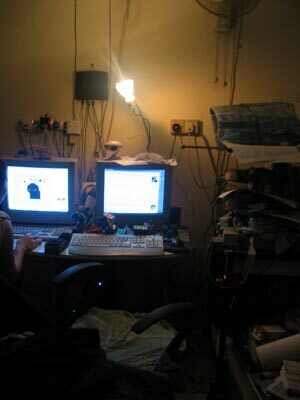 This entry was posted in Geek, Pictures on November 23, 2005 by 2konbla.